Eisenhofer was a normal, red Xweetok in Neopia. The only thing that was slightly special about her was her German name- meaning Mailman- and anytime someone saw her name written down she always had to re-say it for them. “No, it’s Eisen-HO-fer,” she would say, stressing the “O” sound. Other than that, she was just another, young, red Xweetok in the pound. 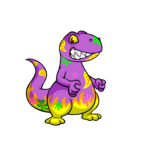 Yet somehow, every neopet in Neopia seemed to know her. “So.” Ms. Chauncey sat down in a chair across from Eisenhofer, a notepad and pen in paw. She crossed her leg over the other and wound her tail around herself so it sat perfectly in her lap. She balanced tiny glasses on the end of her muzzle and her ears twitched from side to side. “Eisenhofer, is it?” the Lupe asked, saying her name like everyone else did- Eisen-HOF-er, with a soft “o”. Eisenhofer just sighed and nodded, not even wanting to take the time to correct the old lady Lupe. “Tell me about yourself.” The Lupe looked at the Xweetok with odd curiosity. The girl was covered from head to toe in a much-too-big blue raincoat. The collar of it covered half the girl’s face and there were no holes in the coat for her from paws to stick out. And on top of everything the girl was wearing a blue slorg hat, making her look like a Quiggle. “Like what?” Eisenhofer asked in her soft, squeaky voice. Ms. Chauncey looked at the Xweetok with one eyebrow raised. How does she do that? Eisenhofer thought, tilting her head and trying to raise just one of her two eyebrows, failing miserably and finally stopping after she got an annoyed look from the Lupe. “Like...” Ms. Chauncey tilted her head. “Why do you wear that coat?” Ms. Chauncey didn’t actually think that would be a good story to tell owner’s, but it was better than nothing, and many pets at the pound were wondering about it. “I don’t really think that kind of story would make owners want to adopt me...” she whispered. The whole point of this little talk-session was so that Ms. Chauncey could put up facts about Eisenhofer so owners would want to bring her home from the pound. “Well, with you shy, quiet pets, we usually do a story that would be somewhat interesting.” Ms. Chauncey sighed loudly and drummed her paw on her notepad. Eisenhofer looked down and nodded; she really did want to be adopted, so if this story would help her, she would tell it. “Get out of the way!” A large, male Grarrl shoved Eisenhofer, making her fall hard to the ground. She glared up at the boy who, for the moment, was considered her ‘brother’. Her foster home wasn’t exactly the best, but it got her away from the pound for a couple months which was the important thing. Eisenhofer was thinking of shouting something at the Grarrl but knew she’d only get abuse for it. How she got stuck in a foster home with three boy neopets was beyond Eisenhofer, but it was still better than the pound. The Xweetok sighed and scrambled to her paws, and gave her elbow a small rub because it had hit the floor so hard. She walked into the kitchen where her foster parent- Santiago- was making them breakfast. The teenager beamed down at Eisenhofer and showed her the pan he was cooking in, showing her that he was making her favorite- omelets. Not those Tyrannian omelets, but real, homemade ones. Eisenhofer grinned big and sat in her seat at the table. “Boys!” Santiago called down the hall where the guys had run off to. A few moments later, as their foster owner was putting an omelet on Eisenhofer’s plate, a Grarrl, Skeith, and Mynci walked in, grinning mischievously. Sam, the Grarrl who had pushed Eisenhofer down, grabbed the girl’s plate. “Thanks,” he cooed and ate the whole thing in a single bite. Eisenhofer had had it; she scowled and glared at the Grarrl, and stood up tall on her back legs. Even though she hardly made it up to the boy’s neck she still felt bigger than him. “That. Was. Mine.” She hissed like a Hissi. Sam grinned down at her toothily. “Yeah, it was.” The boys hooted with laughter. Santiago just sighed. “I’ll make you another one, Eisenhofer.” He smiled. He always seemed to like the Xweetok more than the boys he fostered, but he never stuck up for her or got the other pets in trouble for harassing her. “No,” she muttered. “It's fine. I’m going out.” With that, she walked past the group of chuckling guys and out the door into Neopia. It was a cold, raw day, and the dark clouds in the sky threatened of rain, but Eisenhofer didn’t care. It could be thunder and lightning outside and she wouldn’t want to go back to that house. She loved Santiago like an owner, but she hated those boys with all her heart. Thunder suddenly rippled through the clouds, making Eisenhofer jumped and a tremble shiver down her spine. She sighed and continued walking. She could camp out in the book store if the storm started getting bad. And just as she thought that, the rain started pouring down. Neopets raced frantically about, holding newspapers above their heads and pulling their jackets closer to their bodies. Eisenhofer shivered and wrapped her arms around herself; all she had was a pair of shorts and a T-shirt on, and the rain was like ice against her fur. The Xweetok did not rush home or to cover; she just continued walking through the pouring rain. A couple pets and owners gave the odd pet looks, but mainly people just ignored the shivering Xweetok. “Sweetie?” came a calm, high-pitched, motherly voice. Eisenhofer looked over to see the clerk of a store, a Uni dressed in fancy clothes, looking at her worriedly. “Are you cold? Do you want to come inside until the storm passes?” Eisenhofer glanced around, nodded and walked inside. Once there, the Uni draped a blanket around Eisenhofer and handed her cups of Borovan. Once they were both settled in the chairs of the store, the Uni finally spoke up. “So why were you out in the rain?” she questioned. “I don’t want to go home,” Eisenhofer whispered, sipping the hot beverage with relish. “Why not?” The clerk tilted her head. “My foster brothers aren’t exactly nice to me.” She sighed and looked at the Uni. “Thank you for all of this.” She smiled. The Uni nodded and glanced the Xweetok over. She stood abruptly. “You need some new clothes; those are all worn out, ripped and now soaking wet.” She was grinning merrily, as though she was enjoying herself. She walked with a purpose to the back of the store, leaving a confused Eisenhofer to stare after her. “Here we are!” The Uni finally came back, a big, blue piece of fabric draped over one arm and a hat in the other hand. She walked over and put the hat on the Xweetok, grinning with pride. The Xweetok stood and pulled the blue fabric on, and looked down at herself. It was a rain coat! Eisenhofer looked up at the Uni and grinned. “This is so nice of you.” She beamed. “Thanks, but...” She looked down at the raincoat. “Where are the arms..?” she questioned, trying to find a place in the coat to put her front paws through. The green Uni suddenly looked very embarrassed. “Eisenhofer,” the Xweetok said easily. And the Xweetok headed home to her horrible foster brothers, with her new blue rain coat and blue slorg hat. “That’s it..?” Ms. Chauncey asked, having taken notes on the story on her notepad. “A kind shop clerk just... gave it to you?” Eisenhofer nodded with a smile. “Well... I suppose it’s a good enough story to be put up. 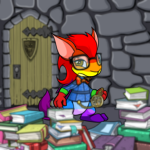 Maybe a Neopian will come and get you.” The Lupe rolled her eyes behind her tiny glasses and stood, walking to the door. “Eisenhofer!” came a loud squeal. The pets instantly stopped talking and pushing. Everyone just froze and looked back at the normal little red Xweetok in the much-too-big blue coat and slorg hat. “That’s her! That’s her!” Finally, Eisenhofer saw that the last pet with the group was the green Uni who had given her the coat. The whole family turned and looked at the tiny, bundled up red Xweetok. The teenage boy- who Eisenhofer could now see was a teenage girl with a very short hair cut- smiled sweetly and walked over to her, all the pets with her followed happily- except for the Halloween Gelert... but he seemed like the type of pet to never be happy. Eisenhofer grinned. “Of course I would love to come!” She was practically jumping on her paws. The girl laughed. Introductions took place on the way home. The green Uni from the store was named Maii, the baby Kacheek was Katie, the Halloween Gelert was Zezt, the baby Korbat was Ryan, and the owner was Kathryn. The pets all seemed very happy with this girl, and Eisenhofer hoped she would fit in well too.